Prior to end the fifteenth century, the Jewish quarter was the most religiously and socially diverse in the city. It represented the pinnacle form of environmental co-existence – a space that dictated close integration due to the Jewish population dominance of the entire city. 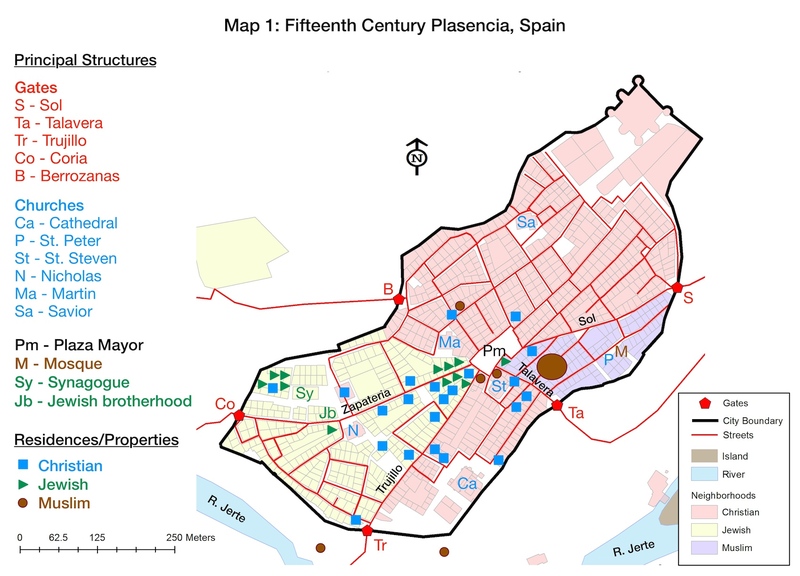 It also raises the larger issue of how the leaders of this community, specifically the Cathedral of Plasencia’s ecclesiastical leadership, chose a path of cultural inclusion during the mid-fifteenth century. This is reflected in the decisions of the Jewish convert to Catholicism, Bishop Gonzalo García de Santa María. During his term (1424-1446), the church increased access to housing leases for Jewish and Muslim families. The cathedral’s former ecclesiastical governors only leased four percent (4%) of church houses to religious minorities, whereas the converso bishop and his functionaries directed twenty-two percent (22%) of all leases to Jews and Muslims . This amounted to an almost six-fold increase in access for Jewish and Muslim tenants. Typically, the cathedral’s Jewish and Muslim tenants were tradesmen, as opposed to religious leaders like Plasencia’s rabbis who tended to live in Jewish-owned homes . The cathedral’s clients included a Muslim family of tailors (the Chicala), as well as Jewish shoemakers (the Aruso), clothing-shearers (the Caces/González), blacksmiths (the Arrañon), and military arms makers (the Capa). The church’s decision to lease property in greater numbers to Jews and Muslims in Plasencia indicates they were inclined to support the traditional approach of peaceful co-existence of the three faiths. A closer inspection of the juderia, both of church-owned and personal-owned properties, reveals a highly intermingled grouping of faiths. Especially interesting is a 1442 church lease to Zanfines Capa, a maker of chainmail (jubetero), because of the multiple economic, social, and religious interconnections revealed by the transaction . First, it is apparent that Zanfines was most likely a recent arrival to the city because the cathedral required him to provide a co-signer (fiador) for his housing lease. By the 1430s, the practice of requiring a co-signer was limited to cases involving new members of the local community or younger men procuring their very first church lease . In this 1442 agreement, Zanfines Capa produced Rabbi Abraham de Loya of Plasencia, a well-known member of the community, as his co-signer. This contract also demonstrates the church did not require Jewish or Muslim parties to present Christian co-signers, but rather the church viewed well-known members of other religious communities to be trustworthy and legally recognizable parties. Equally fascinating is Zanfines’ trade—that of a Jewish arms maker—meant that he likely provided weaponry to the region’s large collection of Christian knights, such as the Carvajals, Estúñigas, Álvarez de Toledos, Almarazes, Camargos, and Monroys. This indicates that Jewish residents provided both financial contributions to the community, in the form of rents, as well as invaluable tools of war that were used by Castilians still pursuing the Reconquista against Islamic Granada. Church homes leased to the Jewish Capas and other religious minorities also expose the significant residential intermixing of the three faiths in Plasencia. Although the Capas’ homes were located on Calle de Rua in the juderia, they were also adjacent to venues that were important to the Christian nobles such as the Carvajals, Santa Marías, and Estúñigas. During the late 1420s, important nobles also established their homes in the religiously diverse section of the Jewish quarter. At the far end of the Jewish quarter (on Calle de Rua/Zapateria and near the Plaza Mayo), Christian knights such Diego González de Carvajal owned three homes during the 1440s . While he lived in one home, he leased others to Jewish residents, such as Yucef Daza, a shoemaker, who lived in the vicinity of other tradesman . The Estúñigas, the Counts of Béjar and Plasencia, positioned their first homes and palace (Palacio de de Mirabel) in a part of La Mota . Similarly, the Señores de Oropesa (the Álvarez de Toledo family) and the Almarez clan owned homes in this area . Deeper into the Jewish quarter, along Calle de Rua/Zapatería, several converso Santa María clansmen resided in another three homes. This residential zone included a large housing complex rented by Diego Jiménez de Burgos, the nephew of Bishop Santa María, and two other housing contracts transferred from Treasurer Gonzalo Gutiérrez de la Calleja to his kinsman, Ruy García de Salamanca, another Santa María relative . The Church of Saint Nicholas (Iglesia de San Nicolás) and the Jewish synagogue were also located on this road. Established in 1326, the church was built on the foundation of an old Roman temple and held special significance for noble knightly families because this was the burial location of multiple lineages. The church held special importance before the royal expulsion of the Jews in 1492 because interfaith disputes were literally resolved at its front doors. In “extraordinary circumstances”, a Jewish judge and a Christian judge heard and adjudicated cases on the church’s steps that involved conflicts between individuals of these different faiths. The synagogue, the Jewish religious brotherhood (confradía de los Judios), and a large block of enclosed Jewish residences (Apartamiento de la Mota) sat across from the church. In 1416, a group of Jewish residents purchased property and built the apartamiento (which had its own protective walls and doors that could be closed at night) to house the Abenahim, Abençur, Abenhabibe, Aloya, Castaño, Daça, and Pardo families . Even this exclusively Jewish block had its own Christian noble in residence. Thus, during the fifteenth century this area – which was distinctly described as the Jewish quarter by the sixteenth century historian Friar Alonso Fernández – was a place where Christians, conversos, and Jews worshipped, labored, and resided together . Archivo de la Catedral de Plasencia (ACP) Actas, Folio 52v-53, 112-113, 200-202v, 223v-225v, 319-326v, 326v-328, 340-345, 361-363v, 378v-380v. Archivo Histórico Nacional-Sección Nobleza (AHNSN) Osuna Caja 298, Documento 3/17. ACP Actas, Folio 31v, 83-83v. ACP Legajo 14, Doc. 25. ACP Legajo 3, Doc. 20; AHNSN Osuna Caja 298, Doc. 3/13-3/14. ACP Legajo 4, Doc. 9, 46, and 47; ACP Legajo 269, Doc. 3; ACP Legajo 12, Doc. 10; AHNSN Frias, Caja 1763, Doc. 3, 31, and 32; AHNSN Bornos, Caja 705, Doc. 3; and AHNSN Bornos, Caja 796, Doc. 2. ACP Actas, Folio 391v-392v, 393-394, 394-395v. ACP Legajo 7, Doc. 22; ACP Legajo 14, Doc. 42; AHNSN Osuna, Caja 298, Doc. 3/17.